Meeting with Moscow State Univesity Rector Viktor Sadovnichy. Putin.BLOG Education Meeting with Moscow State Univesity Rector Viktor Sadovnichy. 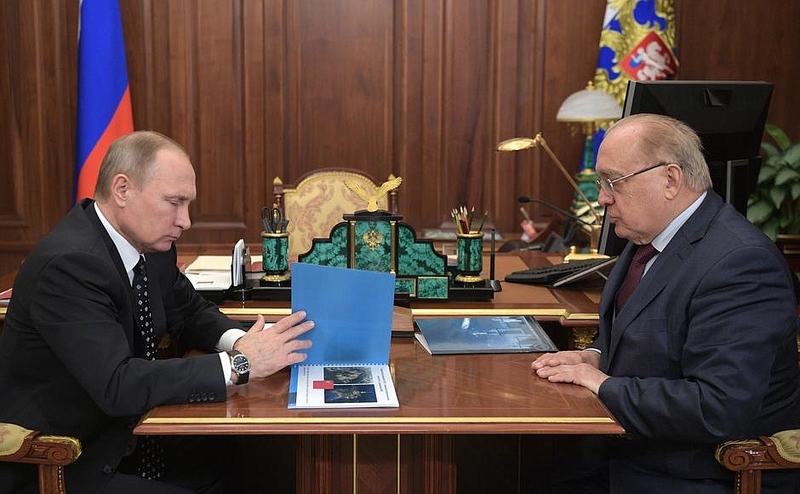 Viktor Sadovnichy updated Russian President on the implementation of the development program at Moscow State University and branch network expansion. Mr. Sadovnichy, what achievements can you report in 2016? Mr. President, we ended 2016 with very good results. We have over 50,000 students, including 35,000 undergraduates and also post-graduates. Last year, we graduated 10,000 students, and this year we will have over 7,000 graduates, 25 percent of them A-level students. We have completed several very good projects connected with the establishment of a University Gymnasium. We have enrolled the first group of talented young people from around Russia who have studied at the Sirius educational center for gifted children. We have built a campus for 3,000 students, a healthcare center with European-class equipment, the Lomonosov and Shuvalov buildings and a library. In all, we have built 1 million square meters of floor space within five to seven years. In other words, we have implemented the development program. We can also report good results in research. For the first time in the history of Russian and even Soviet universities, we have been ranked third in the world by academic reputation, that is, in terms of education quality. This has never happened before: Moscow State University is now rated third in the world, after Stanford and Oxford. It is a very high ranking; we have never received it before. The assessment has become more objective. Mr. President, we have implemented your instructions and have created and are applying our own ranking of universities, the Moscow International Ranking. We will publish the first results, which will include foreign universities, in September – we discussed this at a meeting of the Presidential Council for Science and Education. What can you say about your network of branches? We have unique branches. There are six of them. Look, these are the Lazarev Barracks in Sevastopol. We have completely renovated them. The branch opened in 1999 and now has 700 students. This is a sports centre; it has no match in southern Russia, with a 10-metre-high diving board and a swimming pool. And this is the campus and the academic buildings. In general, we encountered great resistance when we decided to open a branch in Sevastopol back then. We were denied a license and excluded from the local academic environment. We had to use personal contacts, getting support from local education leaders, who continue to live there. And so we saved the branch. It was once in a difficult situation, but now it is prospering. It has five departments: mathematics, economics, geography, the Russian language and physics. It sounds like a full-scale branch. Or take our Astana branch, which I have recently visited. We have set up a research department there at the request of President [of Kazakhstan Nursultan] Nazarbayev, who asked me to visit. Apart from the branch, we also contribute to the work of the Presidential Center in Astana. This is our branch in Tashkent. It was established at the request of President [of Uzbekistan Islam] Karimov and opened in 2006. And this is our branch in Baku, with a campus of its own. It is probably the best university in Azerbaijan. It has six departments and 500 students, the republic’s future elite. Overall, our branches have 3,000 students. It is important that tuition at our branches is in Russian, and their graduates receive MSU diplomas and find employment in their countries. In other words, we are teaching friends; we hope we are. This is our branch in Dushanbe [Tajikistan]; it has been successfully operating since 2010. The project was supervised by the President of Armenia. In fact, presidents sponsor all our branches, which I see as the success of our mission – I consider our work there as a mission. This is in China. In keeping with your agreements with the Chinese leaders, we are opening a joint university in Shenzhen. Our Chinese partners want a building that would resemble the MSU building in Moscow. We had a ground-breaking ceremony and received a [teaching] license; classes are to begin in September. It will be a joint university between MSU and the Beijing Institute of Technology, the first joint university in the history of Russian-Chinese relations. In addition, after your visit to Slovenia, we will open a branch there as well. We have very close ties with our Iranian partners. We have signed 37 agreements and have opened several Lomonosov Centers in Iran. Yes, in Lebanon and Italy. Vladimir Putin meeting with Moscow State University Rector Viktor Sadovnichy. 1 Response to "Meeting with Moscow State Univesity Rector Viktor Sadovnichy."